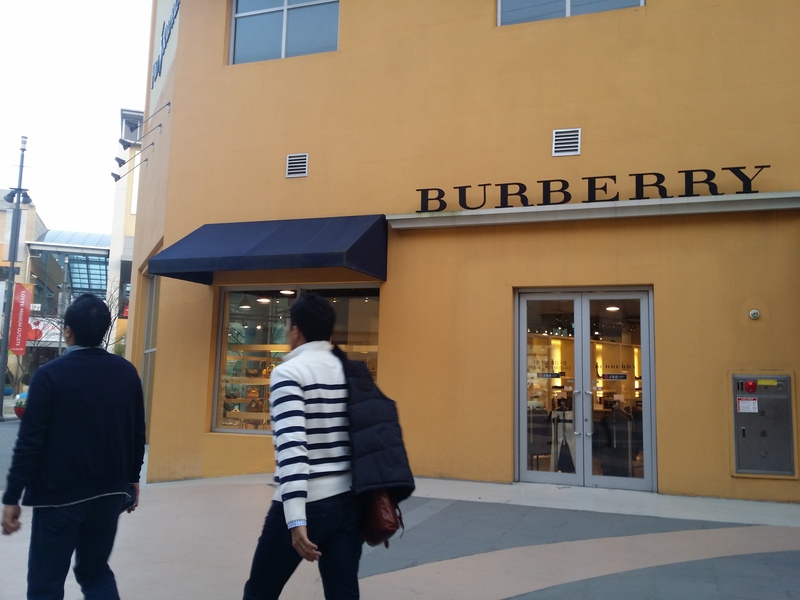 Previously , i blogged about places to go for shopping in Busan. 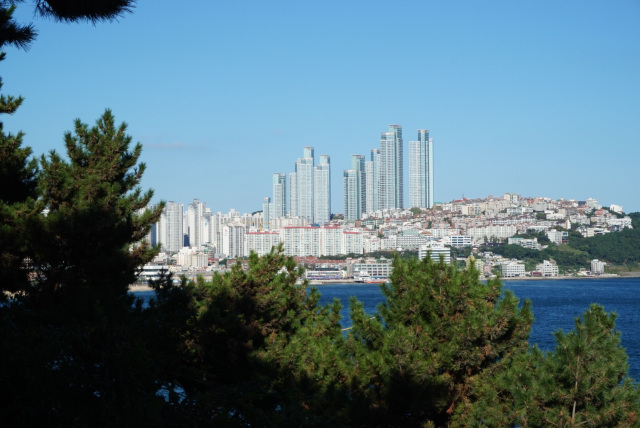 Here are some attractions in Busan which i have been to and some are not that touristy places. 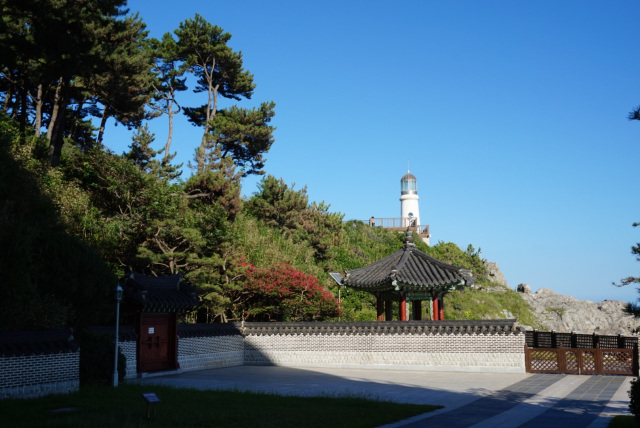 You can visit the lighthouse , National Maritime Museum and take a stroll and instagram worthy picture at Sinseondae Cliff. On clear days , you can see Japan’s Tsushima Island from the observatory. 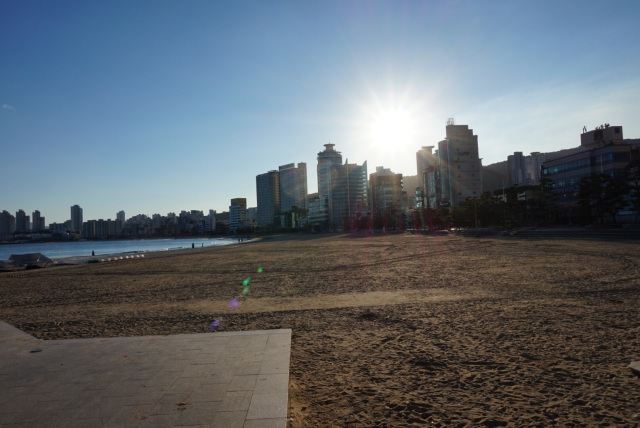 Haeundae is the most famous and popular beach in Busan and Korea. It’s long coast is one of the reason why is really packed during summer. I went there once during summer and omg..so many people in the water and the beach is soo crowded until finding a perfect spot for tanning is so difficult. 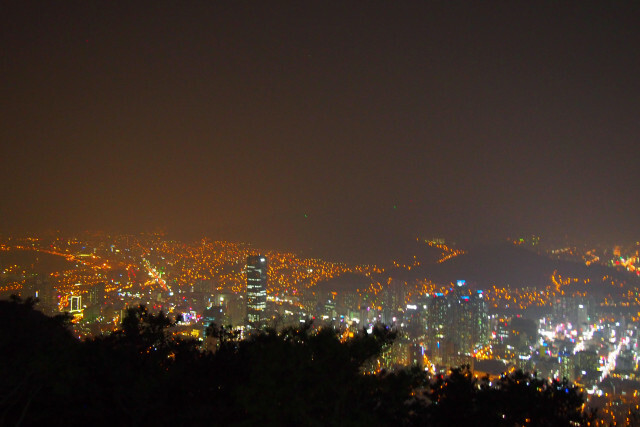 At Haeundae , you can find the clubs , restuarants and bars so hyped up at night. 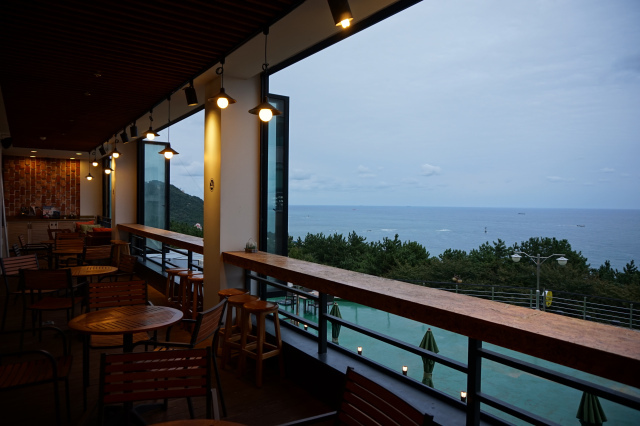 Haeundae has a stretch of restaurants serving really nice Duae-Ji-Kuk-Bap (Pork Soup + Rice ). 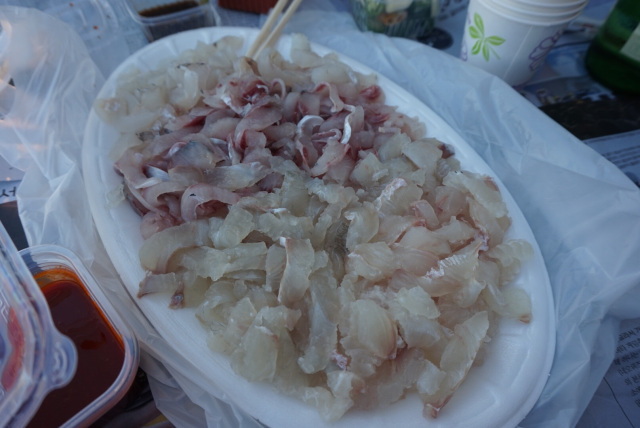 There are also restaurants serving fresh sashimi that goes straight from the tank to your plate on the table. 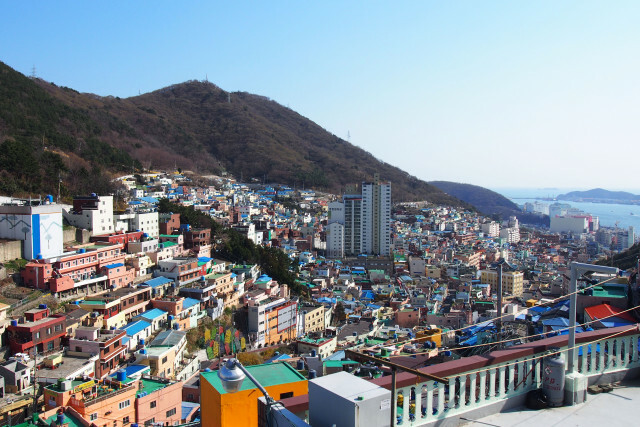 At Haeundae, you can take a walk along Haeundae’s traditional market. 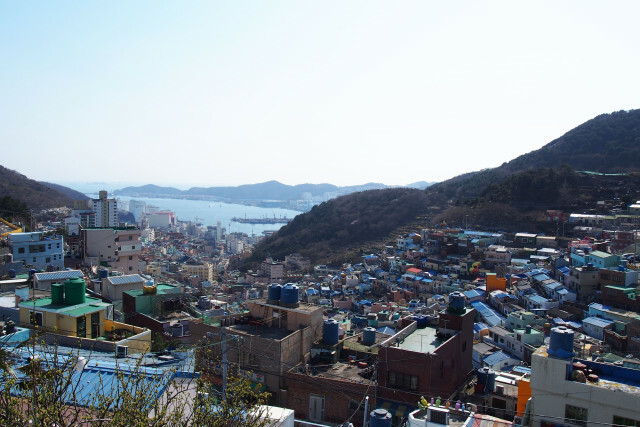 How to walk to Haeundae Traditional Market : Haeundae Station (Busan Subway Line 2), Exit 3. 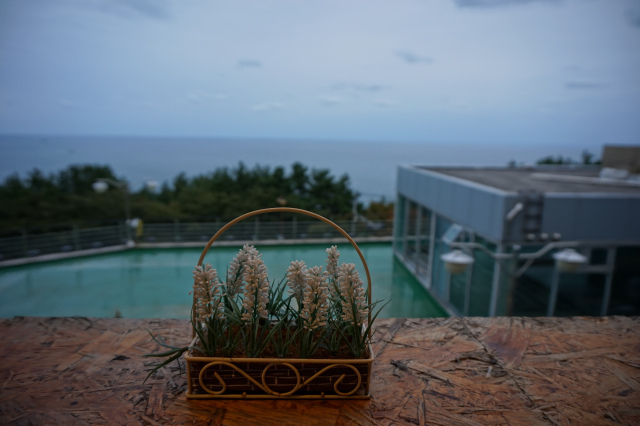 Actually when you walk along the stretch of 500m from exit 5 Haeundae station down to the beach , you will pass by the entrance of the market already. So you can pop by the market first to grab some finger food or street food to munch before continuning to walk towards the coast. 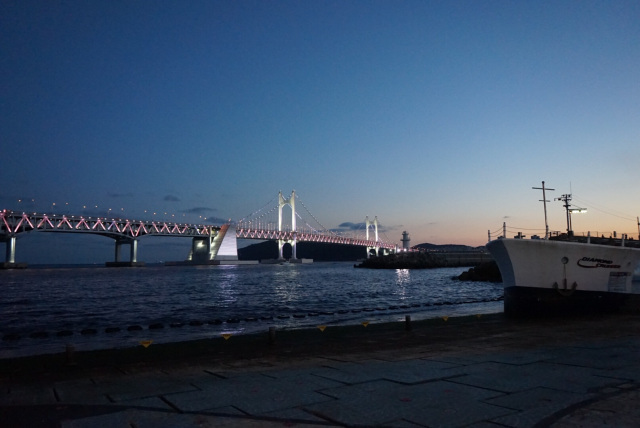 Gwangalli is famous for its bridge. 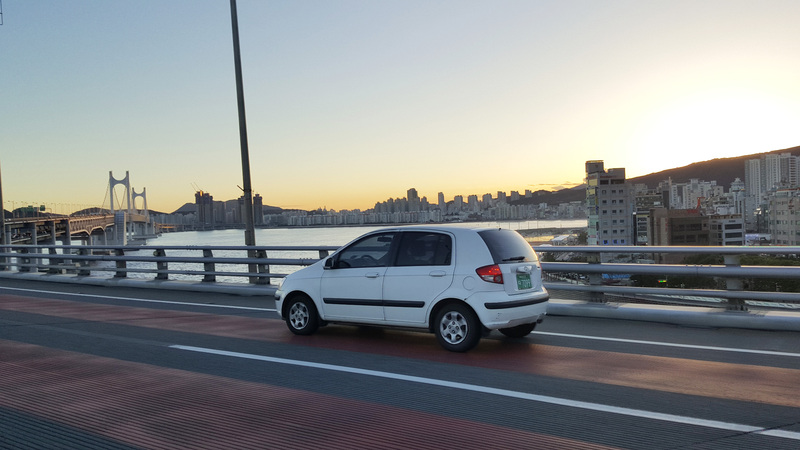 The bridge looks really beautiful and you can see the whole coast of Haeundae and Gwangalli on the bridge. 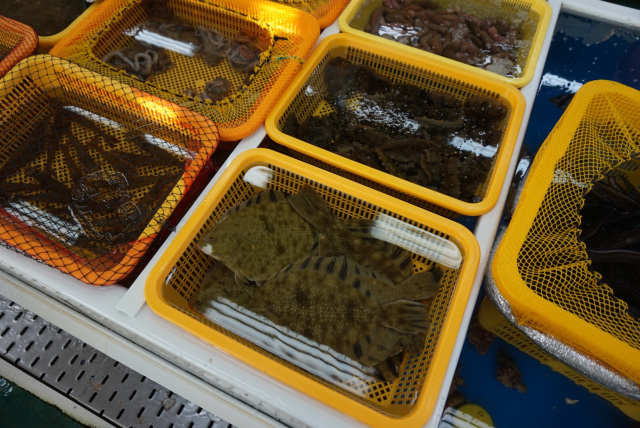 There are also alot of seafood resturants at Gwangalli. 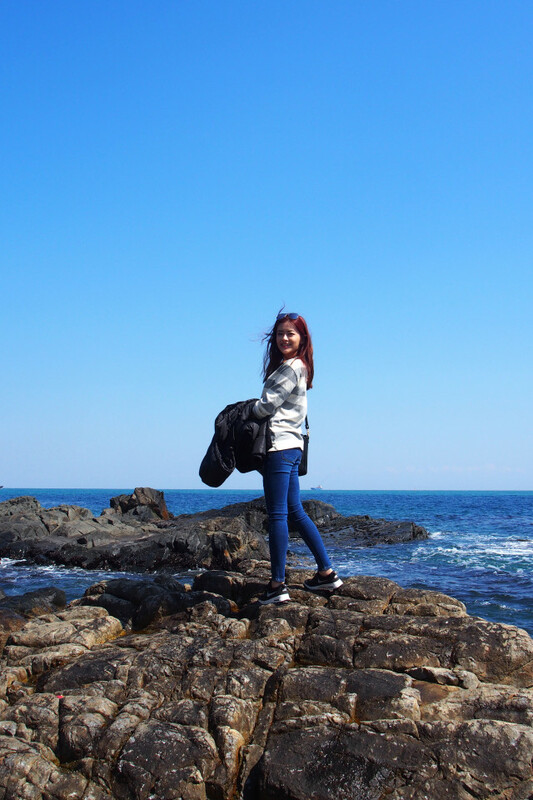 From Haeundae , you can walk to Dongbaek Seom (Dongbaek Island) . There are alot of small huts around for you to take a break and enjoy a relaxing city or sea view. 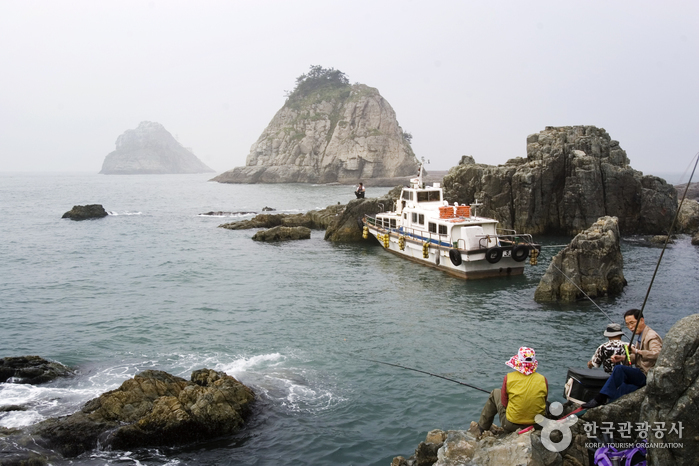 How to get to Dongbaek Seom ? You can see Chosun Westin Haeundae Hotel along Haeundae beach. 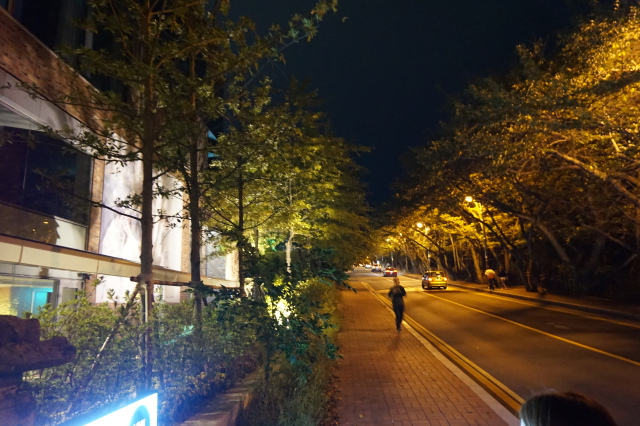 Walk towards the hotel and you will see a road behind the hotel leading to Dongbaek Seom. There is a signage there. So you will not miss it. The path leading to the island. 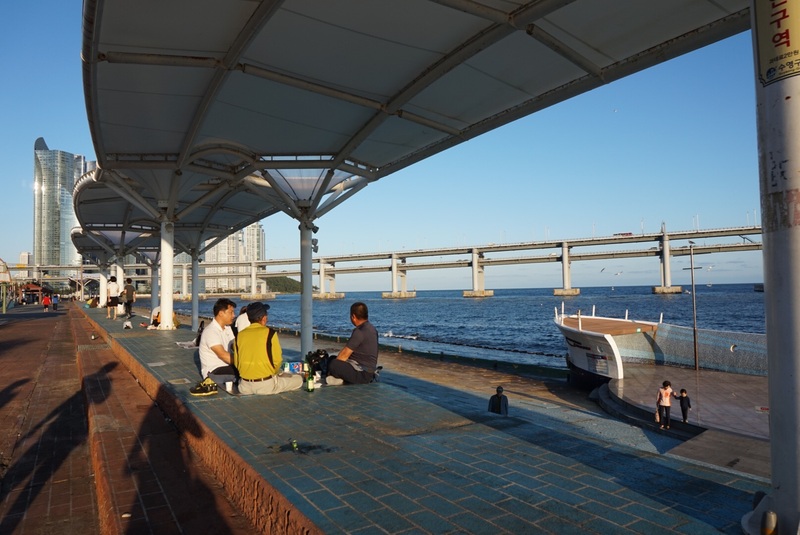 Millak Waterfront Park is connected between Haeundae and Gwangalli beach. This stretch has alot of local seafood restaurants. You can do it the local way. 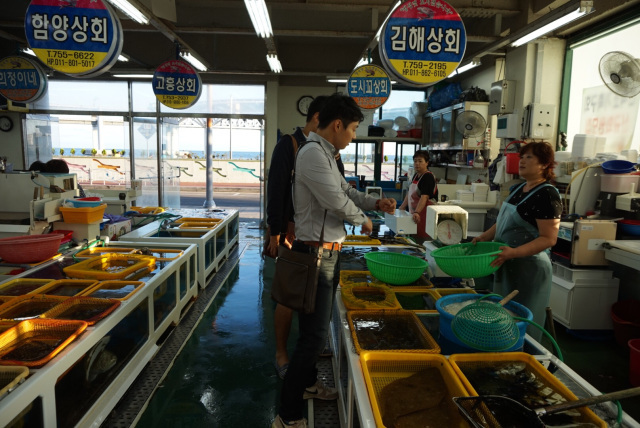 Which is to go to the seafood market place at the park to choose the type of sashimi fish you want , the ahjumma will slice it for you. Do ask for take away. They will include wasabi , soya sauce and a Korean sauce. Go to the 711 store beside to buy a can of beer or whatever beverages you want and sit along the platform steps with the locals . Enjoy your sashimi, the seaview and fresh air like a local. Oppa and his friend chosing my favourite sashimi fish ! Eat like a local here ! 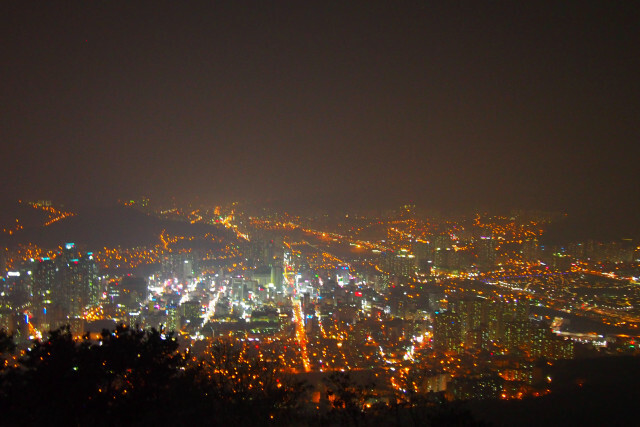 How to get there : Kyungsung Univ./Pukyong Nat’l Univ. Station (Busan Subway Line 2), Exit 5. – Upon exiting the station, make a u-turn, and turn right at the corner. – Go straight about 100m to arrive at the bus stop. – Take Bus 27 or 131 and get off at Oryukdo SK View Back Gate Bus Stop. I have only been there once but i was not in a good condition ( food poisoning ) so no pictures. “Or” means 5 and “Yuk” means 6 in Korean. So depending on the day and the tide, it may appear to be five islands or six islands. 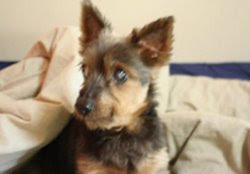 Here is a picture i managed to grab from google. 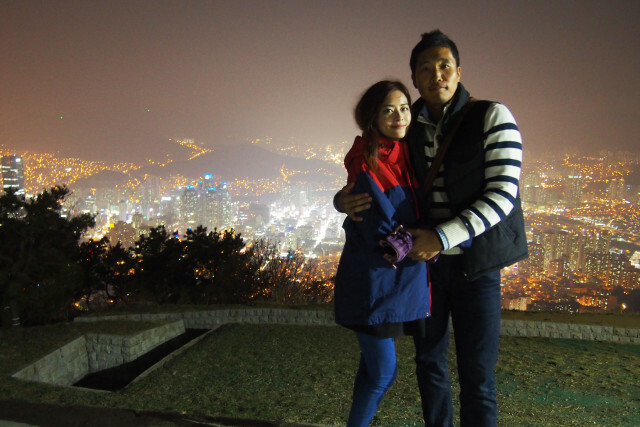 Take a cab up the mountain from Yangjeong Station. 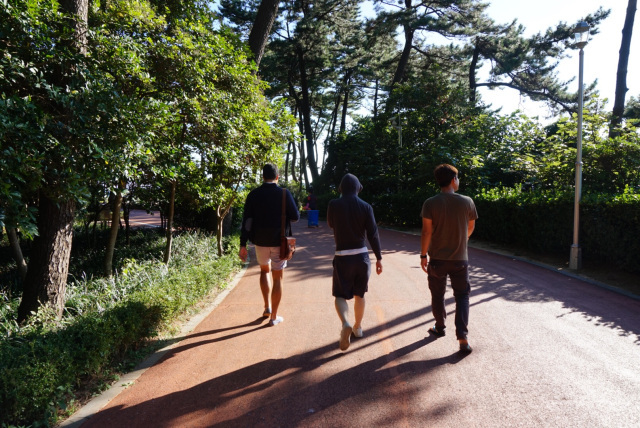 It can be quite a walk so wear a comfortable sneakers or sport shoes. Best to go at night because it is the most beautiful. After a long day of shopping or touring around other attractions and you want to go to somewhere quite and enjoy the scenery at night ? This will be a good place for you. 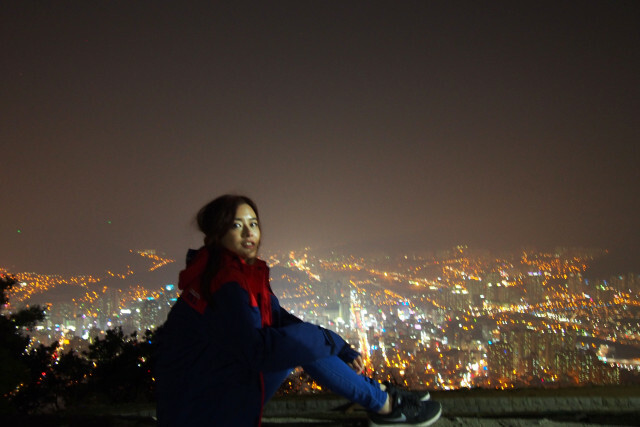 We prepared tea in vacuum flask , went up the mountain , find a good spot and sit down to relax and enjoy our tea. 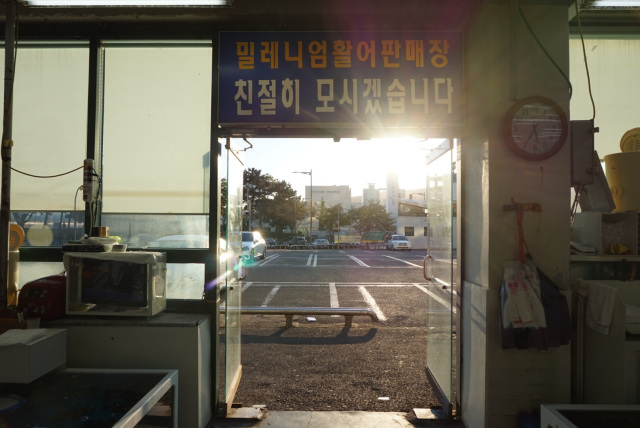 Or you can cab from Nampo-dong after your shopping or meal. 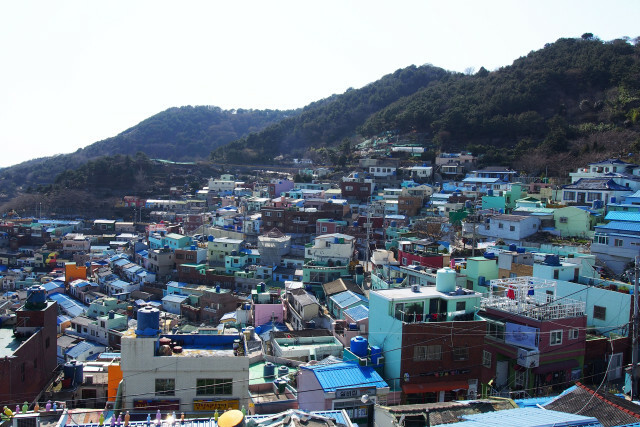 This cultural village is also known as “Santorini of Korea” with its colourful houses. At this place , you can buy sovenirs , experience and see the old Korea and how people in the 1960s live. You need to queue to take picture with the Prince statue. 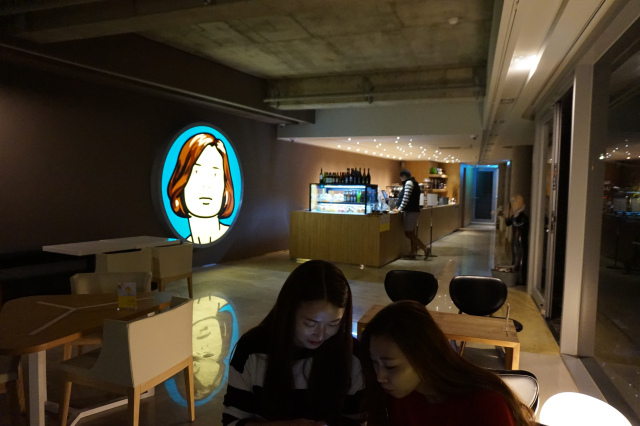 This phototaking spot is about 10 mins walk from the entrance of Gamcheon Village. 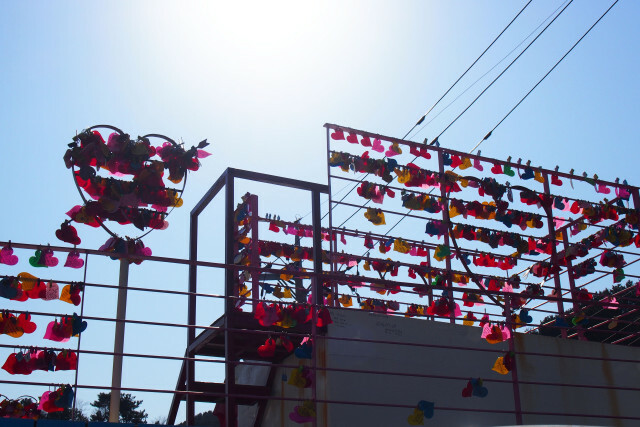 You can rent the traditional school uniforms or hanbok for KRW6,000 and take a stroll around the cultural village to take photos , have your meals and a cup of coffee/tea. We rented the traditional 1960s school uniform. Comes with a cap for the guys but Mr Shin’s head too big lah..no size available lol. There are street food and beautiful coffee houses. You can take a stroll , enjoy the view and walk into the quaint little coffee houses or shops to shop around. Quite complicated via public transport ( bus ) so you can just cab from Haeundae because it is further up abit from Haeundae. Good place for coffee , cafes and abit atas restaurants. Best time to visit during Autumn and Spring. Because you can just sit in the cafe and enjoy the cherry blossom and golden maple trees during Spring and Autumn respectively. I like Dalmaji-gil. Really good place to chill out and walk under the cherry blossom trees ! 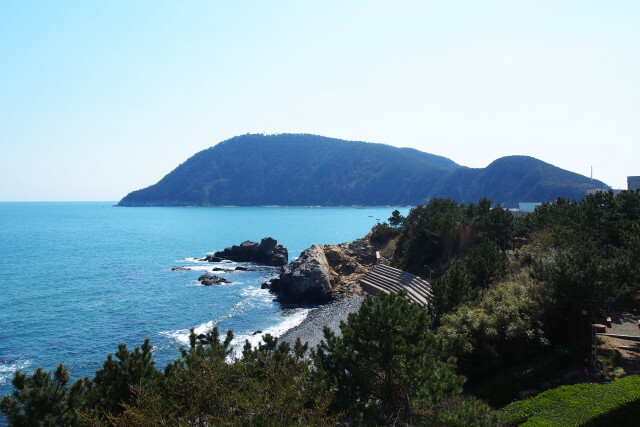 If you want to go for onsen & jjimjibang (Korean sauna) with a great view , you can find many jjimjibang at Dalmaji. Recommended one by Mr Shin is Hill Spa. He goes there often with his friends. 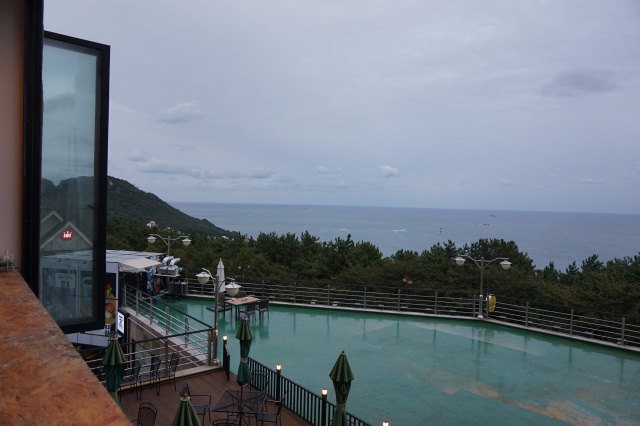 This is the ocean view onsen at Hill Spa. 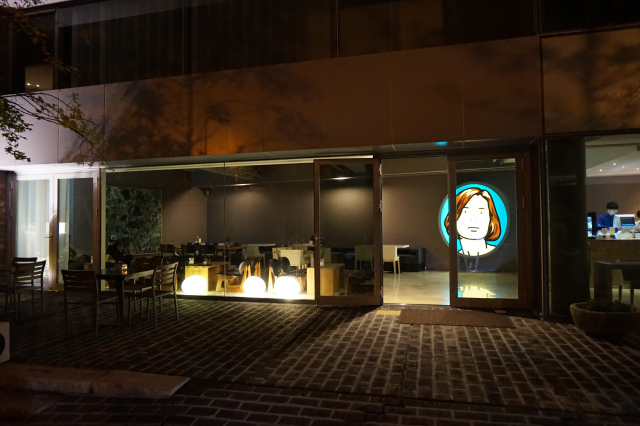 There is a barber shop , cafe , fitness , sauna and onsen at Hill Spa. Actually this is a shopping place which i forgot to add in the previous blog post ! 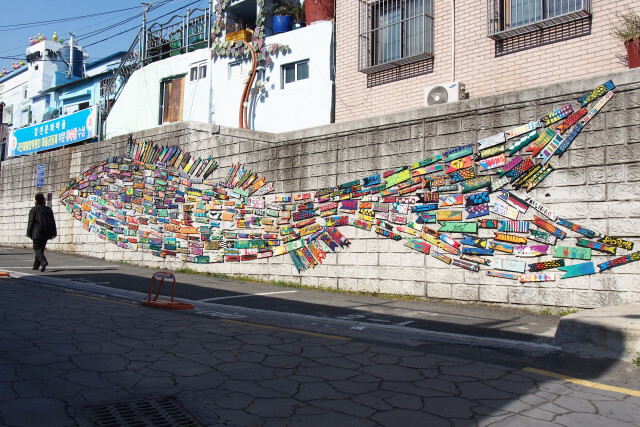 There is one at Busan and at Gimhae (outskirt of Busan). 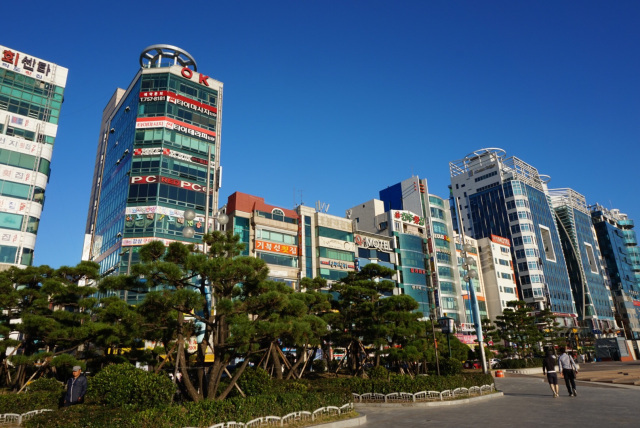 How to get there to Gimhae Lotte Premium Outlet ? Alight at Hadan Station (Busan Subway Line 1), Exit 3 or 4. Take Bus 220 to Lotte Premium Outlets (the last stop). 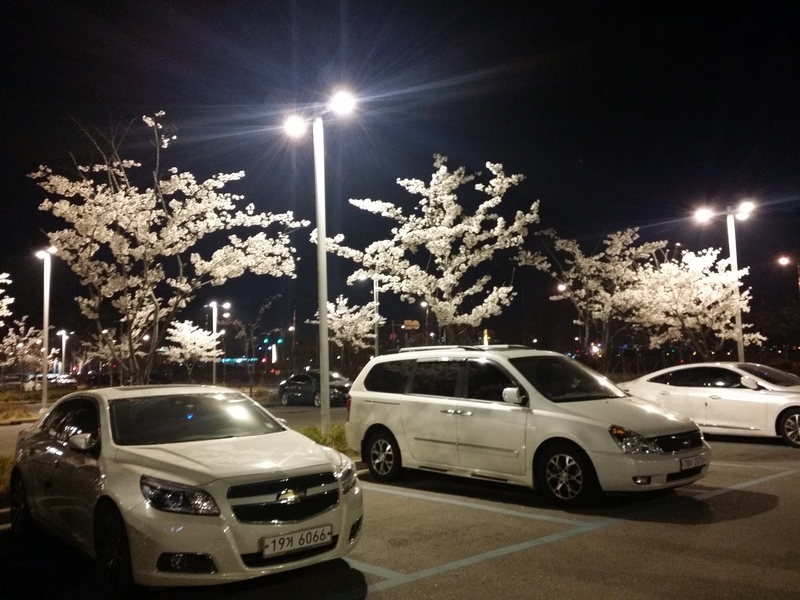 How to get to Shinsaegae Premium Outlet in Busan ? 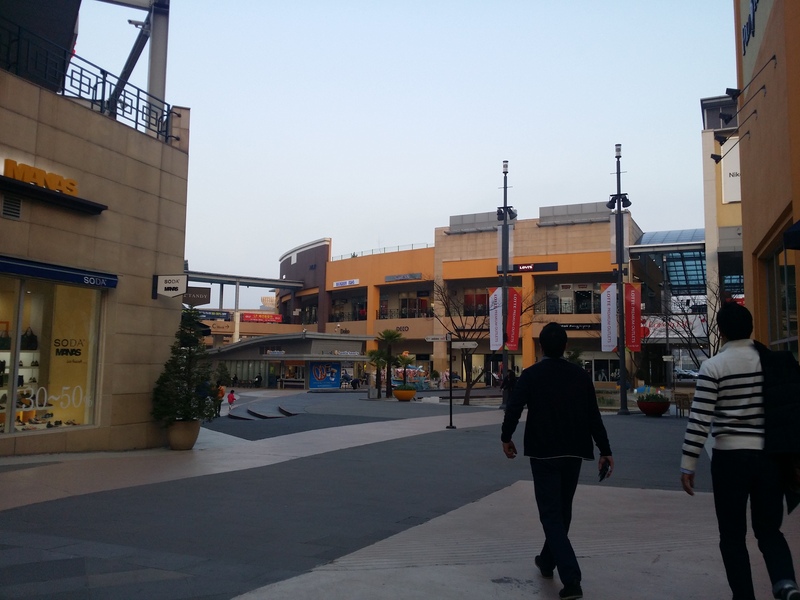 Take Bus 182 and get off at Busan Premium Outlets bus stop. 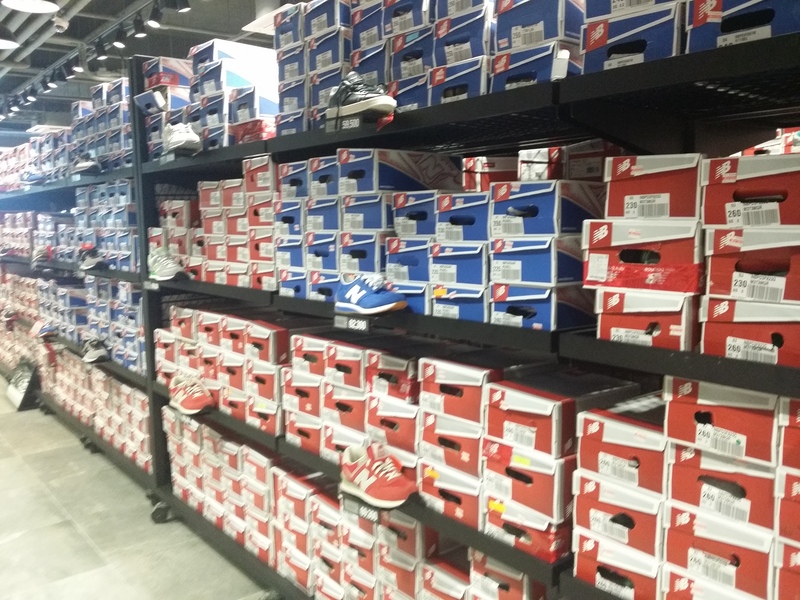 I bought all my sneakers from the outlets. Got my best new balance buy at KRW 39,000 whereas it is retailing at SGD 120 in Singapore ! But i will suggest just to cab from Haeundae. Not very expensive and is more convenient. Only simple street food and no restaurants. So i will suggest you have your meal already at Haeundae or other place before cabbing over. Great view, fresh air and beautiful monuments to see ! This temple was built in 1376. Ready to climb 108 steps to see the rare view of a temple along the shore line ! This entry was posted in Busan, Busan Attractions, South Korea.